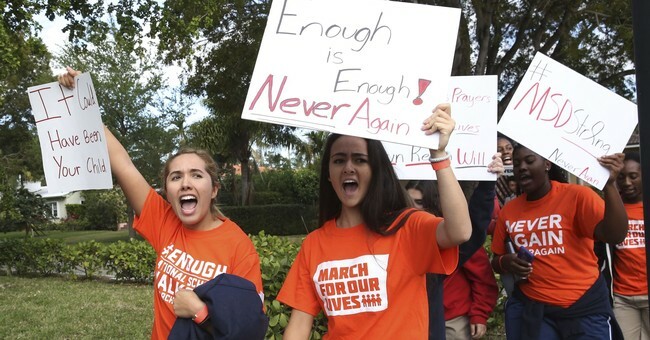 Wednesday, March 14th marked the one month anniversary of the shooting at Marjory Stoneman Douglas High School in Parkland, Florida. Students across the nation organized marches and walkouts at 10 a.m. local time, with a 17 minute moment of silence for those who lost their lives during the Valentine's Day massacre. The walkout was also used to call on state and federal legislators to pass stricter gun control laws. Some teachers and schools, however, were encouraging students to take a different approach: instead of leaving the classrooms, practice kindness and make others feel important. Katsetos told ABC News that she developed the message to fit her individual school's needs after researching information on the national school walkout. She wanted to find a positive message that would resonate with her students and allowed them to participate in both the walk out and the "walk up." "I am adamant about it staying positive," Katsetos said about both movements. "I'm not pushing either. I made those suggestions as alternatives to walking out and just an everyday reminder to include others and be considerate, which is something that I talk about with students each day." Katsetos' message resonated with a number of people and started a movement that encouraged students to practice kindness instead of simply leaving their classrooms. Social media roared with calls for kids to take an active role in creating a culture of acceptance and inclusion. Teachers joined, urging their students to be compassionate and kind to others. Some teachers even shared the "walk up" discussions and brainstorming they had with their students. Clinton High School in Missouri encouraged students to start a conversation with others they don't know. Lewis Cass Jr./Sr. High School in Walton, Indiana held a vote and decided as a class that they would "walk up" instead of walking out. Students in Oak Creek, Wisconsin chose to write their legislators and commit 17 acts of kindness instead of walking out. According to the Edmond Police Department in Oklahoma, one student took part in the "walk up" challenge and thanked police officers for their service. The "Walk Up" movement will likely be far more effective than the national walkout. Encouraging students to be kinder to one another, to respect one another, is going to do much more than a 17-minute walkout that, let's be honest, probably isn't going to change anyone's minds on gun laws. The sad reality is that bullying has morphed in American schools. It no longer is limited to school grounds in the traditional face-to-face interaction. It's now happening online on social media websites. Kids who are bullied have to face their bully 24/7. There's no longer the "safe haven" of going home. They turn on their phones, open up Snapchat or Twitter, and what do they see? The awful, cruel remarks being made about them, posted on the Internet for everyone to see, where they'll live forever. Bullying is no longer a wedgy or being punched for your lunch money. It's evolved along with the Internet. Kids are now using social media, a tool that was meant to bring people together, to further divide themselves from their peers. And we're seeing the detrimental impacts of it each and every day.